What makes bacon so irresistible? its tantalizing aroma? the snappy sizzle while it cooks? or the sweet/salty tang of the flavor? Eating healthy, eating local, focusing on fruits and veggies, ingesting fewer processed foods… I can support the convincing logic of all that, but I just can’t get past my bacon cravings. Have you noticed the abundance of bacon references lately, everywhere you turn it is bacon this and bacon that? bacon salt, baconnaise, bacontinis, bacon everything. Yesterday I read HomesickTexan’s post featuring Chocolate Chip Pecan Cookies with Bacon Grease. Not exactly my thing but I dreamt about bacon and awoke with bacon on the brain. Breakfast today just had to include bacon, and not by itself or in some boring, traditional way. Based on what was available in the kitchen, the best choice was an open-faced bacon, sardine, avocado sandwich. Shades of the Alton Brown original, I think I just added an improvement. Ron slowly shook his head from side to side, muttering something I chose not to hear about my morning food selections. The man actually refused to join the taste test. Note: he did eat two pieces of crispy bacon before he poured his bowl of cereal. I have already described my avocado/sardine sandwich, but this new riff is worthy of mention. Bacon adds the missing flavor pop, it sets my taste buds quivering. Do you need some other bacon ideas? Here are just a few of the many I have found lately. Bacon animation anyone? What are your bacon favorites? For years I’ve proclaimed I didn’t care much for desserts… dark chocolate doesn’t count, it’s a major food group all by itself, a health necessity. I’ll eat an occasional dessert and enjoy it, I’ll bake cookies or muffins for RL, but I just don’t crave sweets. I prefer things savory. Other people bake berry pies, but I just eat berries. 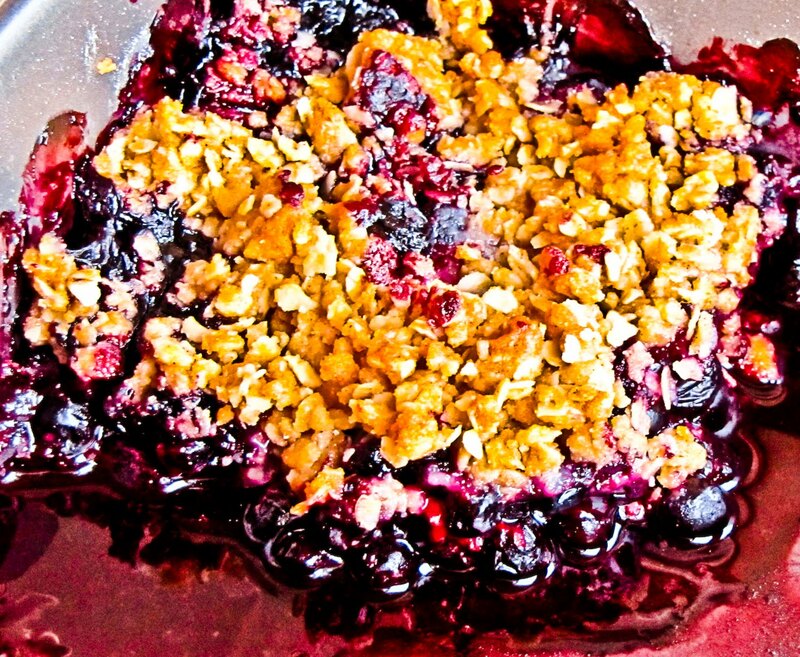 So what’s with the Wildberry Crisp (or Crumble) that came out of the galley oven last week? Cruiser Ron (M/V Tokeen) shared a slice of his fresh blueberry pie at the Baranof Warm Springs dock. The pie was delicious, the sun was out and the berries were so plentiful they just begged to be picked. Who could resist? Not me. I set out to wander the trails and graze on blueberries, huckleberries, salmonberries, blackberries… whatever looked ripe and tasty. The berries seemed to leap off the bushes and into my bucket. No climbing, reaching, stretching or hiking was involved. I just strolled, picked and ate… and ate… and ate. Soon enough I was full, the bucket was full, and there were still berries everywhere. Stop, enough!! Now what? Toss the round berries into a pan of water (fresh or salt) and wait a minute or two. 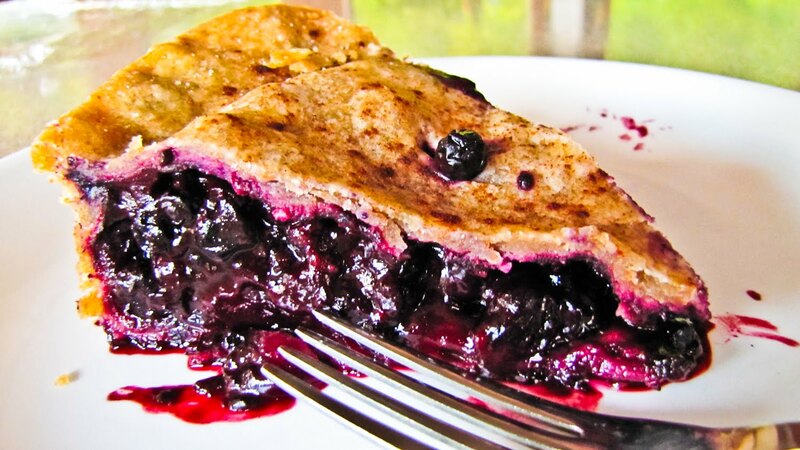 Cleaning blueberries and huckleberries can provide a startling surprise. Little wiggly green worms pop out of a few, just enough to make you wonder just how much protein was consumed while nibbling right off the bush. Moving right along…. There were far too many berries to use immediately, the boat freezer was full of fish, so it seemed that baking was an option. Evidently the effort was a success; by the time I thought to reach for the camera there was just one corner of the pan left to photograph. My wildberries may have had a higher water content than the ones used in the cookbook; the berry juices were quite runny, even after increasing the quantities of sugar and flour. Next time I might try adding some cornstarch to tame the liquid. Of course, it might have set up more firmly if we had waited longer to eat the whole thing! Juicy or not, it was delicious. Pile the berries in an ungreased 1/5 quart baking pan. Mix the sugar, flour, nutmeg and citrus rind together. Sprinkle the lemon juice over the berries; cover with the sugar mixture. Place the butter in a microwave-proof bowl or measuring cup; melt in micro and let it cool a bit. Add the butter and blend until crumbly and lumpy; sprinkle over the filling. Bake in a preheated 375 degree oven for 40 minutes, or until the top is brown and crispy. Be patient and let it cool, to set up the juices… if you can wait that long. The cookbook noted this recipe would serve 4 to 5. In my galley it was sufficient for 1.5 servings with a little left over to serve with ice cream for a late night snack. In case you are interested, here is Ron C's recipe for his pie. This is a 2-crust pie. Sprinkle the top crust with additional sugar and cinnamon before baking. Start at 400 degrees for 10 minutes, then 350 degrees for another 50 + minutes.